I had thought we were done with all the milestones related to body waste. I'd thrown out the diaper genie. Zoe was potty-trained. And we'd since frequented all the public restrooms within a three-mile radius, from local restaurants to parks to the supermarket---all in varying states of cleanliness. But apparently there was one final frontier to be reached, explored, and then stricken from the mental record for eternity: using a Porta-potty. 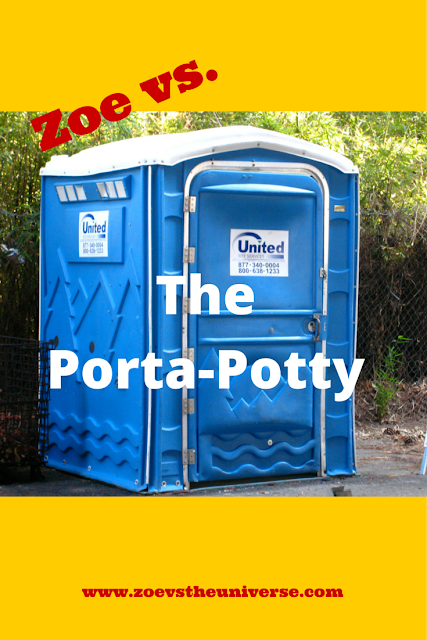 I can count on one hand the times I've used a Porta-potty. Or I could except I've since cut off and burned both my hands. In fact, I'm typing this with a pencil placed between my teeth, tapping the keys one by one. See what I'd do for you? Which brings us to mommy guilt. You see, my daughter had spent all of a recent weekend with extended family. I'd missed her and also felt a bit guilty so I left work early to pick her up from day care and took her to the park before dinner. First, we went home to get her tricycle. Also so she could use the bathroom. Before we left I said, in all caps, "DO YOU NEED TO USE THE BATHROOM BEFORE WE GO?" I asked again, this time adding italics and bold. When she still said no, off we went. Naturally, as soon as we arrived at the park five minutes away twenty minutes later (she is somehow even slower on her tricycle), she had to go. And the public bathroom was closed. On one previous, desperate, occasion last fall I'd had her go outdoors, but on this day it was warm, and so the park was crowded. Plus, two pee-wee baseball leagues were playing in the fields on either side of the building that housed the restrooms in whose jaded shadows she'd once crouched to pee. So I told her we had to go home. All caps, italics, AND bold. But there's nowhere to go, sweetie, I reasoned. The bathroom's closed. To add to her distress (and mine) she also had to poop. Or so she said. Then we definitely need to go home, I told her. Realizing she'd miscalculated, she quickly reconsidered and said she didn't have to poop after all. It was then I spotted the Porta-potty in one of the adjacent baseball fields. For their betrayal I would later put out my eyes with the unsharpened pencil I used to type this. Immediately upon entering, the smell----evil rendered airborne---assailed my nostrils. Before I could wipe the seat, Zoe sat. And put her hands down to brace herself. I cringed, thinking: Would it be irresponsible, as a parent, to let her keep her hands after this? Before you call CPS, don't worry, I did not actually set her hands on fire. I'm not that crazy. Okay, now get ready to dial. "Pee quickly!" I yell-muttered out of the side of my mouth, startling her. She looked up. It was then I saw she was making an all-too-familiar face. Turns out---surprise!---she did have to poop after all. She got down to business as I wondered what the record was for how long a human could hold their breath. She was ruminating herself. Not a euphemism. In fact, each time she paused in her efforts, she asked me questions like, Where was the sink? and, Why was there no flusher? forcing me to open my mouth to respond, as monosyllabically as possible: No pipes. No plumbing. Later. Done? At last she hopped off the seat, turned, and peered curiously into the abyss. I don't want to know what stared back. Then, in lieu of our usual fun game where she strenuously insists that I wipe her, and I insist, just as strenuously, that she's a big girl capable of wiping herself, I quickly bent and did it myself. After making merry with the hand sanitizer, we exited into the fresh air, so she could play for a total of three minutes before we had to walk the twenty minutes home to our apartment which was five minutes away. Ran out of toilet paper? Having a scatological emergency? Not that it would help. But it certainly couldn't hurt.